The Solutré rock is a rock escarpment that is of interest because it is a rare phenomenon in Saone-et-Loire. 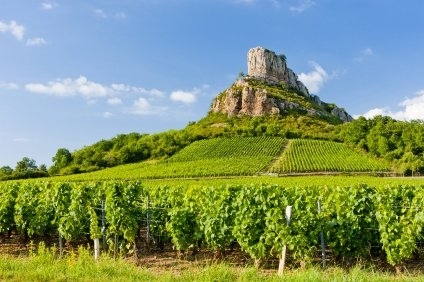 It is known because President François Mitterrand climbed it sometimes, and also because it is the living place of a particular fauna and flora and it is where the famous white wine Pouilly Fuissé is grown. Solutré rock, like the Mont St Michel or the Vergisson Rock, is registered as "Great Sites of France". Moreover, archaeological excavations have revealed traces of prehistoric life on the site. This proves that the locality has been inhabited since that time! Solutré rock is ideal for a family outing. You can take a path that winds through the vineyards and that will take you up on the rock which is 493 meters high. From there, you have an incredible view of the whole region. When the weather is clear, you can see up to the Jura Mountains. The tour lasts about 1h30. It is accessible to everyone, but it is important to know that when you undertake to the summit, the road is dangerous. A sign tells you "You agree on the routes to the summit, at your own risk... Beware of slippery tiles and gaps. " Info: Set next to Le Préty River, this 3-star hotel is located between the Mâcon and Beaujolais vineyards. It offers a shaded terrace and an outdoor swimming pool, just 12 km from Mâcon town centre. Info: Set in the village of Solutré-Pouilly, this hotel is 1 km from the geological site, the Rock of Solutré. Homemade foie gras is served in the gourmet restaurant, and guest rooms offer views of the vineyards. Info: Surrounded by vineyards in the Burgundy region, this bed and breakfast offers wine tasting and a swimming pool with views of the landscape. The lounge includes a TV and library. Info: Fasthotel Well inn Mâcon sud is located between the Macon vineyards and the Beaujolais region. It offers free Wi-Fi access and free on-site parking. Info: Le Moulin du Gastronome faces the prehistoric rock of Solutré and is a 10-minute drive from the A5 motorway. It offers an outdoor swimming pool with a shaded garden.